If you've got a Chase account, you may have noticed quite a few changes to the Android app within the past few days. Those include an adaptive icon, app shortcuts, and an updated interface with a lot more functionality. 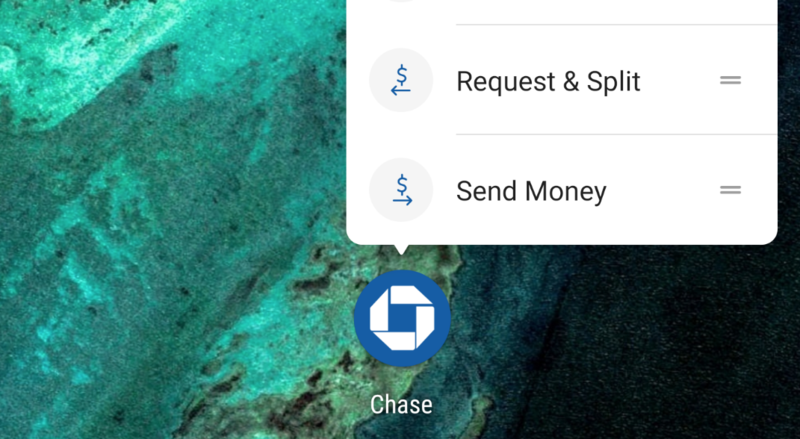 Use App Shortcuts — a long press on the app icon takes you to deposit checks, send, and request & split money options. Merge your phone contacts, see when a friend's enrolled in Zelle®, and use a one-click add for payees with Chase QuickPay®. Manage your debit card coverage and overdraft protection for eligible accounts. Streamline payment and transfer options for your checking and savings account. You can now invest with You Invest℠ by J.P. Morgan. You can check the changelog above to see what's new (aside from the adaptive icon, which isn't mentioned for whatever reason), but the highlights to most of you will probably be the said adaptive icon, the app shortcuts ('Deposit Checks,' 'Request & Split,' and 'Send Money'), and new 'Pay' and 'Transfer' buttons on the home page that replace the former 'Move Money' header. The update should be live for everyone on the Play Store, so be sure to check for that if you haven't yet received it.